Would you be surprised if I told you that a California court just determined that the Batmobile is entitled to copyright protection as a character? Let that sink in for a second ... the Batmobile is entitled to copyright protection as a character. Now, think about your own entertainment properties for a second -- Do you have a "character" entitled to copyright protection that you didn't realize was a character? This matter was decided when DC Comics, owner of the copyright registrations in the Batman comic books, brought a copyright and trademark infringement action against Mark Towle (doing business as Gotham Garage) for producing and selling unlicensed replica vehicles of the Batmobile, as well as other automotive products bearing Batman-related trademarks. Ruling in favor of DC Comics on a motion for summary judgment, the court found that Towle's sale of Batmobile replicas constituted trademark infringement and copyright infringement. But, how does selling a replica Batmobile constitute copyright infringement? Recall that copyright law is intended to protect the expression of an idea and that under the present Copyright Act, copyright protection subsists in original works of authorship fixed in any tangible medium of expression, now known or later developed, from which the works can be perceived, reproduced, or otherwise communicated, either directly or with the aid of a machine or device. Generally, copyright protection has been denied to "useful articles" or items with an intrinsic function, such as automobiles. However, jurisprudence has developed the "useful article" exception, which grants copyright protection to non-functional, artistic elements of an automobile design that can be physically or conceptually separated from the automobile. In this case, the court recognized that DC Comics was in the business of licensing replica Batmobiles and reasoned that because there may be non-functional artistic elements of the Batmobile that may be separated from the utilitarian aspect of the automobile, such artistic elements are entitled to copyright protection. More specifically, the court found that the Batmobile was an extension of Batman's own persona through the appearance of interactive and high tech gadgets, the consistent use of the "Batmobile" name, and the incorporation of bat-based motifs in the Batmobile, thereby entitling the Batmobile to copyright protection. In other words, this decision provides a rights owner with an extension of copyright protection to cover visually depicted inanimate objects so long as such objects display a distinct set of identifiable and distinguishing traits. Therefore, what does this mean for you? Well, it means that you should give some thought to any potential hidden "characters" in your entertainment property or brand and decide whether they need some protection or specific inclusion in your strategic licensing program. Do you have any visually depicted inanimate objects with a distinct set of identifiable and distinguishing traits in your entertainment property? If so, then you may have an asset worth protecting. I would argue that Marty McFly's DeLorean time machine from Universal's Back To The Future movie franchise and specifically its "flux capacitor" is a "character" protectable under copyright law (in the interest of full disclosure, NBCUniversal, owner of the Back To The Future pictures, is a client). I think you could certainly argue that Harry Potter's Nimbus 2000 broomstick (used in his victorious Quidditch matches) with its distinctive stirrups, broom handle and etching, may arise to the "character" level and thereby may be entitled to copyright protection. Without question, merchandising is an essential revenue stream and tool in building any entertainment-related brand or property. Any entertainment property rights owner or brand owner should be vigilant in protecting its rights through trademark and copyright protection programs and strategic licensing programs. After this decision, rights owners can now turn to yet another element of copyright protection in preserving their rights. Let's Talk Licensing! If you have any questions or comments about any of the foregoing, or if you have any questions about intellectual property creation and preservation strategy as it relates to entertainment law or license agreement matters, I welcome the opportunity to discuss them with you. I invite you to contact me at (310) 581-2868 or JSayson@saysonlaw.com. I look forward to speaking with you and helping your business grow. Law Offices of Sayson & Associates is a boutique law firm in Santa Monica providing legal services to artists, visionaries, professionals and business entities of all sizes in the spheres of traditional entertainment, evolving new media and the vanguard space where the meet and overlap. In a competitive business climate where ideas are currency, it is imperative that you work with an experienced law firm that knows how to protect your interests. 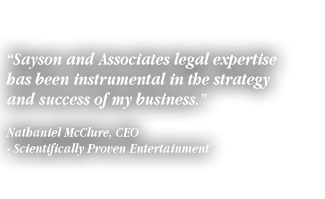 Our attorneys are experienced negotiators who achieve optimal results for our clients.